Home » Forensics » Forensic traps made on your own can help you gain visible or invisible evidence! Forensic traps made on your own can help you gain visible or invisible evidence! Don`t you have the impression that sometimes, the objects in your room have changed their places, the documents were piled in a different order and the pendrive was on the right side of the diary and not on the left? You are not the only one to have this perennial feeling: Who has eaten from my plate? Who has broken off a piece of my bread? Who has been using my fork? The questions were asked by dwarfs from the famous brothers Grimm`s tale, when they noticed that the order of their home had been disturbed. It couldn`t have been one of them as they were all busy in the ore mine. The look at seventh dwarf bed cleared up the riddle but, hadn`t it been for the fact they found the perpetrator, how would they have known who the suspect was? A similar anxiety has eaten… the bears in „The Story of the Three Bears”, when The big Bear noticed that his pillow had been slightly shifted. Children heroes did not have problems with catching a bit sleepy perpetrators almost red-handed but, in adult life, we happen to meet people who would invigilate us or even steal from us without paying much attention in leaving the „crime scene” untouched and we would ponder over how to find evidence without scaring them away. Accessible and inexpensive traps with fluorescent substances can be helpful and easy to use! How do UV powder and UV paste work? For women, fluorescent powder can be like a transparent cosmetic which fuses with foundations and creams of different shades. UV powder is a marking chemical but not colouring and invisible, with the naked eye, substance. Why is this substance exceptional? 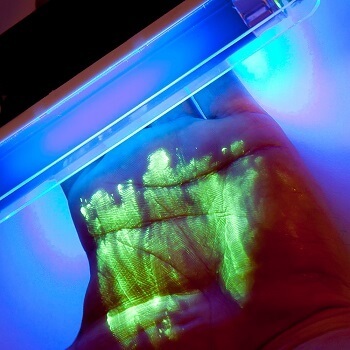 If we lit an invisibly marked object or a hand which had touched the object, with an ultraviolet lamp, we would see an intensive shine (green, red, blue, orange or purple, depending on the chosen product). It is how we can identify perpetrators using colourless, permanently marking traps. Those traces are irrefutable evidence of your private correspondence having been read, your documents looked through and your money or belongings stolen. This fluorescent powder penetrates skin and stays there for some hours. Washing hands won`t help and if you touch your face with your marked hand, UV powder will settle on it. Is fluorescent powder really colourless? 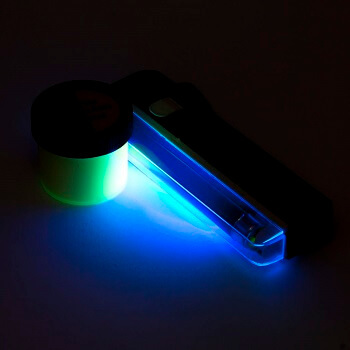 As we can read in many articles about forensic investigations, marking powders can be two-coloured in the ultraviolet light. It means that the powder is visible in ultraviolet light which has a concrete wave range of 254 and 366 mm. Depending on the range, powder will have a different colour. 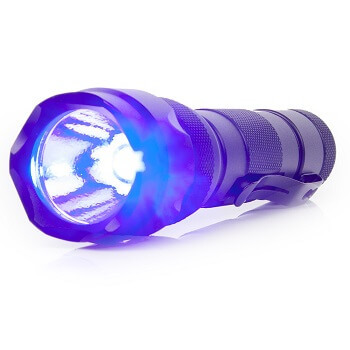 The information about wave range in which traces of powder are visible in the ultraviolet light, can be found on every product. Why is the use of forensic traps a good idea? Unlike monitoring, lockers and other protections, forensic marking traps, colourless or colouring (they will be described later on), are not used just in case, without reason, but in order to prove a committed offence. A forensic trap is used when we have a problem with finding the perpetrator or we have a suspicion that an unauthorised person has touched our belongings. The traces are evidence for court. In comparison with hidden cams and alarms, such a trap using fluorescent powders and other forensic substances is simple and inexpensive. You simply have to match the powder to the surface and wait for the offender to be nabbed. What can we mark with UV fluorescent powder? The fluorescent powder can be applied to mark paper surfaces, such as books, banknotes, envelopes, files, but also wooden (varnished or raw). Wooden varnished, metal, plastic, glass surfaces require a waterproof, non drying up paste which sticks to a smooth, slick surface. 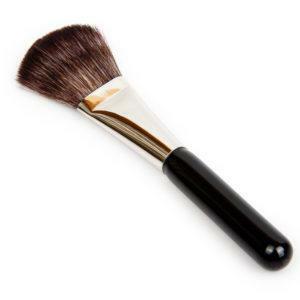 Durability of powder setting is influenced by external factors such as rain or wind. Therefore, it is recommended to use UV powder indoors. 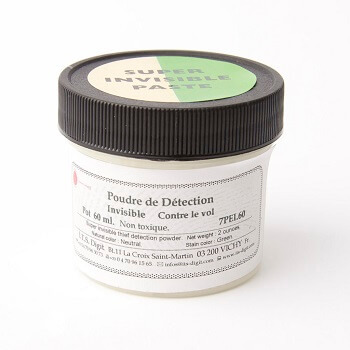 UV powder discreetly penetrates not only the skin, but also clothes of the thief. The traces on clothes may also be left by UV paste, but it does not spread as easy as powder. We should remember to wear disposable latex gloves when applying the powder. Both products should be applied with a synthetic brush and only a minimal amount should be taken in. Marking bank notes happens to be problematic as fluorescent substances disturb „natural” marking. 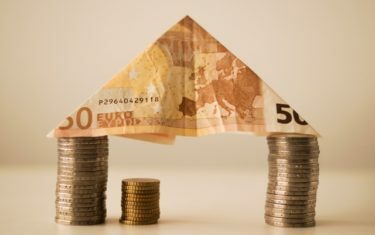 A marked bank note should be exchanged in the bank. How does UV varnish work? Colourless fluorescent varnish in spray is applied differently, but it works similarly to UV powder. UV varnish is invisible in daylight. It is possible to see traces left by it, not until we light the surface with a UV lamp (similar to a lamp used to check the authenticity of bank notes). Although, it is possible to use UV varnish to mark construction materials, wind and rain can lessen their durability. The chemical substance in aerosol can be easily applied on the wood stored outdoor. Interestingly, with fluorescent varnish we can mark objects using templates and patterns of our own ideas. How does a felt-tip pen work? Certainly differently than other markers with intensive, fluorescent colours do. Think about a movie or a book, where private notes cast a new light on controversial cases, sometimes even after a character`s death. Experts would easily cope wth notes written with a fluorescent marker, using a UV lamp. An average Smith, however, will look at an empty piece of paper with no excitation. A felt-tip marker can be used to create short, secret notes, but we also can mark objects with it. A set of a lamp and a marker pen costs little money and it gives a range of possibilities, even for children. In some toy shops, UV wax crayons resistant to harsh weather conditions are available. Colouring forensic traps. What is visible marking? Substances used to visible marking will leave traces only on human skin. The contact with human sweat makes the substance take colours. The process lasts a few minutes. 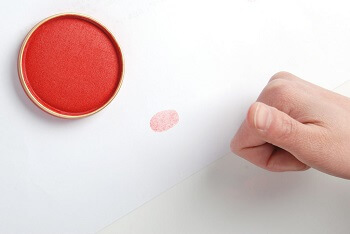 Unfortunately, red traces on your hands won`t disappear as quickly as signs of confusion on your cheeks. Active ingredients penetrate the skin and will stay on its surface as long as for a couple of hours. Scrubbing your hands won`t help. The colour will also stay on touched object. If we choose invisible marking, the only way to find a suspect is to target UV light on hands. So, invisible detection is used when the circle of suspects is quite narrow and those people use vague, changeable arguments. In order to corner just one of them, we can use the method when the person, under pression, agrees to have the hands examined. However, it`s nearly impossible with a group of 20 or so. In this case, it is strongly recommended to use visible detection. The suspected person will have „the evidence” on their skin visible at once. We have to choose well a part of the day, knowing that traces of colouring stay on the skin for only several hours. Is the use of forensic traps legal? Deliberate spreading rumours of a valuable object or classified documents that we possess. Leaving doors wide open, and voicing premeditatedly loud the information that we are about to leave the place for some time. Suggesting that we could intentionally forget important documents on the desk, when targeted person fails to know about the marking trap. Mentioned above, chemical substances (powders, varnishes, pens), available in specialised shops, are safe for health. Obviously, the use of toxic substances is inadmissible as well as substances of unknown provenance. A potential offender cannot be electrocuted or mutilated by a criminalistic trap. Find out more about forensic traps! A forensic trap can be documented in audio or video materials.